1Jacobs Technology, Inc., St. Petersburg, FL 33701. 2U.S. Geological Survey, St. Petersburg, FL 33701. 3Florida Geological Survey, Tallahassee, FL 32304. This Digital Versatile Disc (DVD) publication was prepared by an agency of the United States Government. Although these data have been processed successfully on a computer system at the U.S. Geological Survey, no warranty expressed or implied is made regarding the display or utility of the data on any other system, nor shall the act of distribution imply any such warranty. The U.S. Geological Survey shall not be held liable for improper or incorrect use of the data described and (or) contained herein. Reference herein to any specific commercial product, process, or service by trade name, trademark, manufacturer, or otherwise does not constitute or imply its endorsement, recommendation, or favoring by the United States Government or any agency thereof. This disc is readable on any computing platform that has standard DVD driver software installed. The minimum software requirements are a Web browser, portable document format (PDF) reader, and text editor. If you cannot fully access the information on this page, please contact USGS Information Services at infoservices@usgs.gov or 1-888-ASK-USGS. In September and October of 2003, the U.S. Geological Survey (USGS), in cooperation with the Florida Geological Survey, conducted geophysical surveys of the Atlantic Ocean offshore northeast Florida from St. Augustine, Florida, to the Florida-Georgia border. This report serves as an archive of unprocessed digital boomer subbottom profile data, trackline maps, navigation files, Geographic Information System (GIS) files, Field Activity Collection System (FACS) logs, and formal Federal Geographic Data Committee (FGDC) metadata. Filtered and gained (a relative increase in signal amplitude) digital images of the seismic profiles are also provided. Refer to the Acronyms page for expansions of all acronyms and abbreviations used in this report. 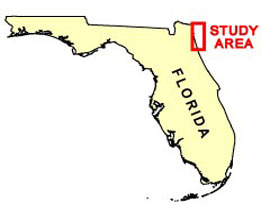 The USGS St. Petersburg Coastal and Marine Science Center (SPCMSC) assigns a unique identifier to each cruise or field activity. For example, 03FGS01 tells us the data were collected in 2003 as part of cooperative work with the Florida Geological Survey (FGS) and that the data were collected during the first field activity for that project in that calendar year. Refer to http://walrus.wr.usgs.gov/infobank/programs/html/definition/activity.html for a detailed description of the method used to assign the field activity identification (ID). The naming convention used for each seismic line is as follows: yye##a, where 'yy' are the last two digits of the year in which the data were collected, 'e' is a 1-letter abbreviation for the equipment type (for example, b for boomer), '##' is a 2-digit number representing a specific track, and 'a' is a letter representing the section of a line if recording was prematurely terminated or rerun for quality or acquisition problems. The boomer plate is an acoustic energy source that consists of capacitors charged to a high voltage and discharged through a transducer in the water. The transducer is towed on a sled floating on the water surface and when discharged emits a short acoustic pulse, or shot, which propagates through the water, sediment column, or rock beneath. The acoustic energy is reflected at density boundaries (such as the seafloor, sediment, or rock layers beneath the seafloor), detected by hydrophone receivers, and recorded by a PC-based seismic acquisition system. This process is repeated at timed intervals (for example, 0.5 seconds) and recorded for specific intervals of time (for example, 100 milliseconds). In this way, a two-dimensional (2-D) vertical profile of the shallow geologic structure beneath the ship track is produced. Refer to the handwritten FACS operation log (PDF, 442 KB) for diagrams and descriptions of acquisition geometry, which varied throughout the cruises. Table 1 displays a summary of acquisition parameters. See the digital FACS equipment logs (PDF, 9-13 KB each) for details about the acquisition equipment used. The archived trace data are in standard Society of Exploration Geophysicists (SEG) SEG Y (Barry and others, 1975) format (rev. 0), except for the first 3,200 bytes of the card image header, which are stored in ASCII format instead of the standard EBCDIC format. The SEG Y files may be downloaded and processed with commercial or public domain software such as Seismic Unix (SU) (Cohen and Stockwell, 2005). See the How To Download SEG Y Data page for download instructions. The printable profiles provided here are Graphics Interchange Format (GIF) images that were filtered and gained using SU software. Refer to the Software page for details about the processing and links to example SU processing scripts and USGS software for viewing the SEG Y files (Zihlman, 1992). The printable profiles can be viewed from the Profiles page or from links located on the trackline maps. Detailed information about the navigation system can be found in table 1. To view the trackline maps and navigation files, and for more information about these items, see the Navigation page. The SEG Y files are available on the DVD version of this report or on the Web, downloadable via the USGS Coastal and Marine Geoscience Data System (http://cmgds.marine.usgs.gov). The data are also available for viewing using GeoMapApp (http://www.geomapapp.org) and Virtual Ocean (http://www.virtualocean.org) multi-platform open source software. NOTE: No data were collected for 03FGS01 line test2 or 03FGS02 line sj5. Navigation is intermittent for 03FGS01 lines sj17 and sj15. On the trackline maps, the location of missing navigation data within a line is inferred by linear interpolation of the first and last known data points, and large gaps are represented by a dashed yellow line. The Disc Contents page is a diagram with links to the locations of all files and folders contained on this disc. To access the information contained on this disc, use a Web browser to open the file index.html. This report is divided into seven sections: Acronyms and Abbreviations, Disc Contents, Navigation Data and Maps, Seismic Profiles, Field Activity Logs, FGDC Metadata, and Software. Links at the top and bottom of each page provide access to these sections. This report contains links to the USGS and collaborators or other resources that are accessible only if access to the Internet is available while viewing these documents. Funding for this study was provided by the USGS Coastal and Marine Geology Program (CMGP) and the Florida Geological Survey (FGS). We thank R/V Geoquest captain Wade Stringer of the FGS for his assistance in data collection and Janice A. Subino (contracted with Jacobs Technology, Inc., at the SPCMSC) for her assistance in the preparation of this document. This document was also improved by the reviews of Jack Kindinger (SPCMSC) and Barbara Poore (SPCMSC). Barry, K.M., Cavers, D.A., and Kneale, C.W., 1975, Recommended standards for digital tape formats: Geophysics, v. 40, no. 2, p. 344-352. Available online at: http://www.seg.org/publications/tech-stand. Cohen, J.K., and Stockwell, J.W., Jr., 2005, CWP/SU: Seismic Unix Release 39: A free package for seismic research and processing: Golden, Colo., Center for Wave Phenomena, Colorado School of Mines. Available online at http://www.cwp.mines.edu/cwpcodes/. Zihlman, F.N., 1992, DUMPSEGY v1.0: A program to examine the contents of SEG Y disk-image seismic data: U.S. Geological Survey Open-File Report 92-590, 28 p. Available online at https://pubs.usgs.gov/of/1992/0590/report.pdf. Calderon, Karynna, Forde, A.S., Dadisman, S.V., Wiese, D.S., and Phelps, D.C., 2012, Archive of digital boomer subbottom profile data collected in the Atlantic Ocean offshore northeast Florida during USGS cruises 03FGS01 and 03FGS02 in September and October of 2003: U.S. Geological Survey Data Series 670, 1 DVD.